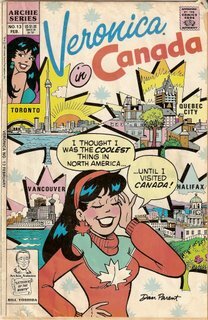 Few things are as exciting as being able to read about Veronica Lodge visiting your hometown. This special edition comic was printed in February of 1991. I got my hands on a copy in university. I am sad to say that Veronica's visit to my country is...problematic. There are some serious errors. I wouldn't say that it accurately portrays life in Canada. Veronica is visiting her relative (cousin) Ginger Snap, who is from "the Canadian branch of the family." The comic gets the best part over with first: The Maritimes. It flows east to west, and she visits every province and territory, which is impressive. They certainly chose some weird highlights, though. First of all, is Canada known as the "Peaceable Kingdom?" 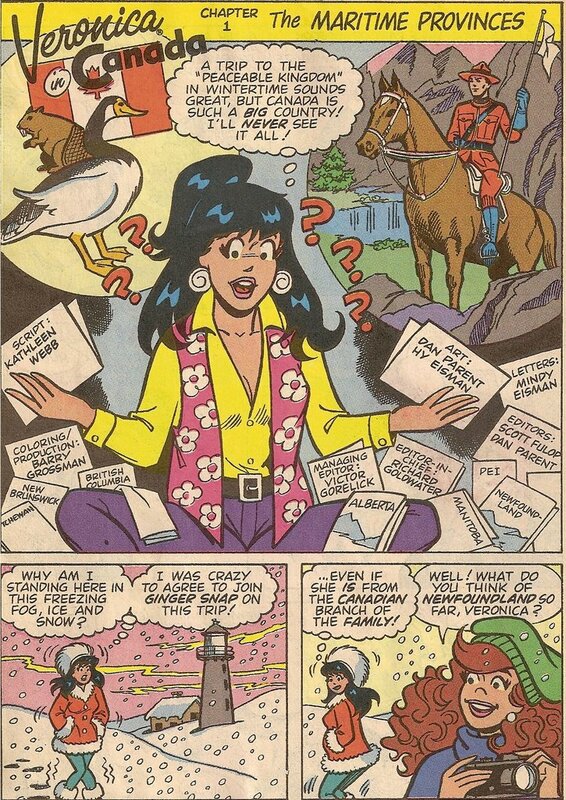 So we see that Veronica has some ideas about Canada: mounties, geese, beavers and flags. Alberta and Newfoundland were able to spring for brochures with pictures on the cover. According to this comic, much of Canada looks just like Newfoundland in those lower panels: white terrain with various historic things standing alone. On to Nova Scotia! Represent! The first panel: ouch. Ginger doesn't even defend Nova Scotia as not being a frozen wasteland. That hurts. They only do one thing in Nova Scotia: go to the Fortress of Louisbourg. I've only done that once and it was a long time ago. If someone asked me to recommend one thing to do here, I don't know that that is what I would suggest. Also, mushrooms are avant-garde cuisine, according to Veronica. Shopping? On Prince Edward Island? On Sunday? In 1991? Good luck! They continue their trip across Canada at a breakneck pace. They eat in a fine restaurant at the top of the CN Tower (which I am pretty sure doesn't exist. There's no restaurant there, is there? Anyone?). They do some dogsledding. They rock Carnaval in Quebec. They see some polar bears. Veronica gets hot for some mounties. I'm really not being biased in only showing panels from the Maritimes. The rest of the comic is boring. It becomes more and more generic the further west she goes. 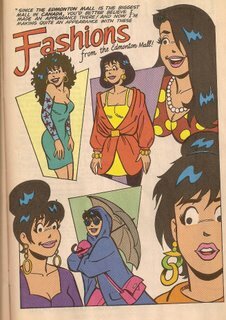 It's not like I expected an Archie comic to be really good, and I guess you could learn a few boring facts from reading this. 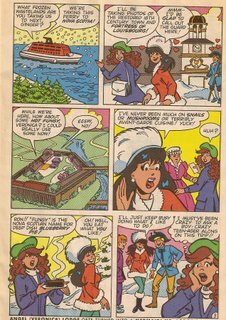 It's part of a larger series that has Veronica travelling to various countries. 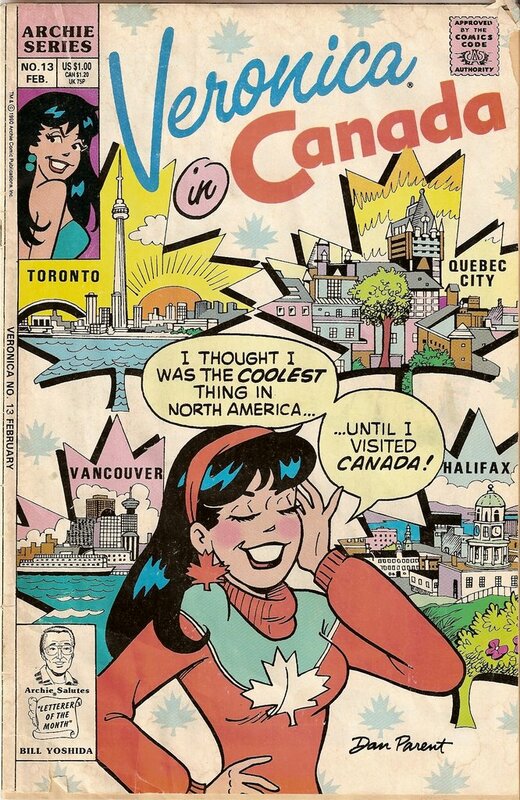 It's unlikely that you would see all of Canada in a few days, but there is a lot that is unlikey about Archie comics.